What is curb appeal and why does it matter? If you’ve heard it mentioned on House Hunters once, you’ve heard it a million times: “curb appeal” matters. But what is curb appeal, and why is it that so many buyers are fixated on this one aspect of a home? Well, first impressions are important, and how your home looks from the street – the basic concept of curb appeal – sends a loud and clear message to potential buyers. Why does curb appeal matter so much? Depending on how your home is perceived from the street may add or subtract thousands of dollars to the sale price. It can also affect the duration your home sits on the market because it sets the tone for potential buyers who come for a viewing. A home with good curb appeal will convince a potential buyer to take that next step and view the inside, and they’ll go in with a positive attitude. In contrast, a lack of attractive curb appeal can plant a seed that the home isn’t right, even before a buyer sees the interior. As a homeowner there are several things that can be done to ensure that your home gives a good first impression. 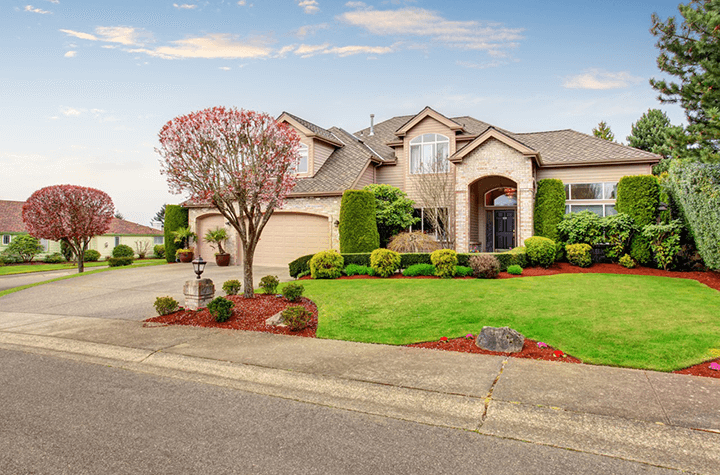 Since curb appeal plays such a significant role in the value of a home, investing time and money into the home’s exterior and front lawn will pay off in the long run. Here are some tips for creating curb appeal. Landscaping – A well manicured lawn, pruned shrubs, and weeded flowerbeds not only elevate the look of a home, but send out the message that a home is well maintained. There are various levels of landscaping you can take up to enhance curb appeal, and as a homeowner you can gage what is worth the cost and effort. Fresh mulch is a quick and easy way to spruce up a garden, while adding an attractive stone pathway will cost more time and money, but both will help add to the curb appeal to varying degrees. Maintenance – The maintenance of your home may be the most important factor when it comes to curb appeal. A clean, organized, well maintained home front indicates to a buyer that the same can be found inside. So take the time to clean out the gutters, wash the windows, put a fresh coat of paint on the house, and stay on top of yard work. In addition, it is advised that you assess the condition of your roof and any other structural components, such as fences or stairs, that may require maintenance. Add some colour – Don’t just spruce up siding or a fence with a fresh paint job; go a step further with a red door or blue bench. Colour sticks with people, so they will not be as quick to forget “the house with the red door” when shopping around. If a brightly painted accent seems too flamboyant, try adding some colour with bright flowers. Little details – Much like adding a splash of color, adding little details like an interesting doorknocker or handle, architectural house numbers or a unique mailbox, will stand out in a buyer’s mind, and separate your home from the others. Including simple yet quirky touches in the front of your home will give it a sense of character.